The picture shows our general layout. They should always be in that order but not necessarily in that exact place - water levels and training courses might require the marks to be moved. One pink mark (S) is often used to mark the other end of the START and finish line. It can also be our SPARE mark so could turn up anywhere on the course! D = Dam (the dam end of the lake). A = Arm - only usable when the reservoir is full. You can't really miss our marks! The committee boat displays a board indicating the marks (buoys) to be rounded in the race and in which direction they have to be rounded. Occasionally, we may show the word 'gate' under a mark - this requires you go between certain marks (ie treat like a 'gate'). This will be to make the ADO's job easier, so it is usually found near the committee boat. The letters on the board have either a red or a green background. RED means you must leave the mark on your PORT (left). GREEN on your STARBOARD (i.e. right) side. The board also shows the number of laps to be sailed. The course board above shows the course as D as the first mark (round to port). The B (starboard) M (starboard) H (port) then S. The start line is therefore between the Committee boat and the S buoy. There are 52 laps to do (JOKE!) unless the race is shortened.... WARNING ... they usually are! H flag comes down with horn sound - indicates GO! GO! GO! Individual & General - If the Duty Officer can identify boats that has crossed the line early the Individual flag (with horn sound) is raised. The DO may (but not obliged too) call out the boats number. 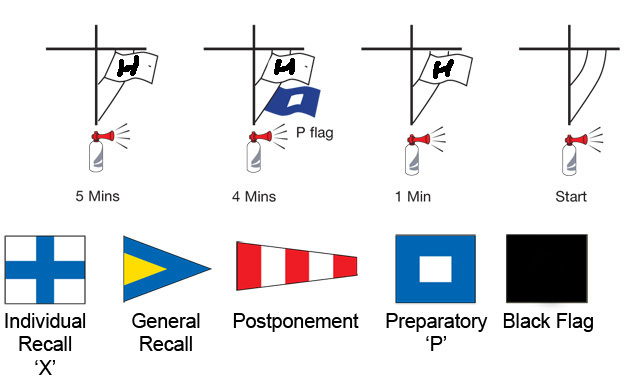 A general recall flag (double blast on the horn) is raised if there too many boats over the line early and culprits cannot all be identified. Basically, start abandoned - come back and start all over again. Postponement - Often because the start line is not long enough, occasionally bad weather imminent either way, not used very often by us. Can be raised at any time before or during the start sequence. Black Flag - Replacing H flag in the start sequence means you have all been very naughty and the next boat to cross the line early will be disqualified. (We do sometimes use this flag). 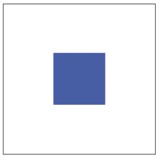 Shortened Race - International code Flag S, is used when a race has been shortened, either when the wind dies or the race is taking too long. It helps race officers to get a result, so that somebody wins, rather than nobody! We will often use this flag. Accompanies two horn sound when lead boat rounds the last mark before the finishing line. After the lead boat finishes all other boats crossing the line finish (Grand Prix style). Instead of starting the fleet all at the same time a Pursuit race sends boats off at the start at differant times depending on their Portsmouth Yardstick (PY) rating. The slower classes are started first then the faster classes. In theory all boats should finish at the same time. A boat's finish place is it's position in the fleet at the finish horn. You must know your PY for your boat before racing. A flip-over book with these numbers are displayed on the Committee Boat. All boats finish at the same time. You should note the sail numbers of the boats in front of you and behind you when the the Committee Boat indicates the finishing time. Competitors should know to START when their PY display goes. E.g. a Solo on 1146 (corrected to 115) starts as 115 disappears and the horn is sounded automatically by the timer. A Solo for example, should know that displaying 115 means there are 30 seconds, 45 seconds or 1 minute, depending on the pursuit length, prior to their start. An important part of Thursday evenings is the social side - a simple race with a nice meal and a chat in the clubhouse afterwards. These are pursuit races of 35 mins duration for a ‘scratch’ boat. This is when ‘0’ is shown to the fleet. HANDICAPS- Initial numbers are allotted by discussion and agreement between entrant and duty officer. Racers will have either a ‘plus’ time ‘ or ‘zero’ or a ‘minus’ time. Thereafter handicaps will be adjusted, based on the previous race, as follows 1st place time gets + 1 and last place time has -1. If a competitor’s initial handicap is revealed to be grossly wrong then a larger adjustment should be made so as to place them in the middle of the fleet in their next race. START - The start will be between a boat and a designated mark with 5-4-1-0 countdown. This starts the race for the slowest boat with a ‘P’ flag and/or a sound signal. Thereafter boats will start at 1 minute intervals related to their handicaps. The time in minutes before and after the scratch boat start will be displayed. The time displayed will indicate the handicap of the next boat ie - when your numbers goes - you go. FINISH - The race will be finished between a boat and a mark chosen to make the race as near as possible 35 mins form ‘zero’ for the leader. The DO may however ‘sweep up’ the tail enders by moving down the fleet. ENTRY - Entrants should indicate their intention to race by recording on a sign-on sheet their boat class, sail number and handicap and whether a fee of 20p has been paid. The winner of the evenings race takes all!